Here is a master list of names to replace the names in Dungeon World. Here is some brief background on the Land of Ten Thousand Gods, the setting for my Dungeon World hack. I tried to follow the Dungeon World rule of making maps but leaving gaps. So, for example, I only placed the very largest cities on the map (except for Fish-For-Dinner, which is the place where I would start my campaign) and I tried to keep my description of areas short and punchy to allow for development by interested players. The map of Wet Plains and the surrounding areas can be found here. … and there are monsters. On occasion there is a double eclipse of the two moons, and for some reason as yet unknown, this weakens the barriers between worlds, allowing monsters entrance into the land. Depending on the completeness of the eclipse, this may result in only a few monsters arriving, or many. But once in a great while there is a solar eclipse involving both moons that darkens the sky and brings on night at noon. Such an event is referred to as a Night of Blight, because the number of monsters which appear is tremendous. During a Night of Blight, all of the Land of Ten Thousand Gods is assailed, and everyone, from the lowest peasant to the richest king, must fight for survival. In the aftermath of a Night of Blight nations fall, cities are wiped off the map, refugees flee across the land, and the long task of clearing away the infestations of monsters and re-establishing civilization begins again. The last Night of Blight was 57 years ago, and only now is trade being re-established across the Land of Ten Thousand Gods. Travel through mountainous regions is still treacherous, and heroes willing to fight to expand the boundaries of civilization and clear away monstrous infestations are in high demand, and gain great prestige. Wet Plains exports to all of its nearby neighbors, and since the last Night of Blight has been seeking to re-establish contact with surviving nations further away as well. Major exports are rice, jute, and seafood. Wet Plains is ruled by a large, raucous, but generally benign royal family. Their various antics, politics, and inter-family squabbles are a favorite topic for gossip throughout the realm, but overall they try to be fair to the people they rule and don’t usually set taxes too unbearably high. The Elf Road river runs through Wet Plains, eventually losing itself in a large coastal delta marsh. In addition, there are many minor rivers throughout the land, which are used as a major means of travel. Currently, roads are entirely local affairs, and though there has been talk of rebuilding the road between Big Drum City and Library, nothing has yet been done about it. Big Drum City – The Capitol of Wet Plains, and the largest city. Named for the extensive use of drums by the local government. Drums are used to warn of fires, to make major announcements, to celebrate major events, and are often carried or played as a fashion statement. Local custom and belief says that drums drive away evil, and the population has made that belief into a central element of their society. Big Drum City is where the Royal Family lives, where the High Court is held, and where most trade and commerce occur. It is a very cosmopolitan city, and has a population that is highly diverse. Even the occasional Gnoll can sometimes be seen in the streets, and a Gnoll embassy is located here. Library – this is Wet Plains center of learning. The Royal University is located here, and gives instruction on a wide variety of subjects including mathematics, literature, languages, and thaumaturgy. Library also hosts a large number of manuscript and book sellers, dealers in “magical” items and ingredients, loremasters, sages, magicians, and natural philosophers. Ten-Thousand-Temple City – if any deity has a religious hierarchy, there will be a temple here. Across most of Wet Plains (and indeed beyond as well) worship of the gods is considered largely a private affair, and while small (or large) shrines exist throughout the land, it is only in Ten-Thousand-Temple City that one can find the truly spectacular temples, orders of monks and nuns, great statues, and troves of ancient religious lore. It is said that at any hour of the day or night at least one god walks the streets in mortal form. Fish-For-Dinner – the largest seaport in Wet Plains, it was largely destroyed during the last Night of Blight, and has been recovering over the last 50 years. Remnants of extensive ruins of a larger city still surround the town, though sporadic efforts at reclamation continue as time and money allow. The town is still sometimes plagued by monsters left over from the Night of Blight, and has occasional problems with Gnoll pirates as well. The Theocracy of One God is a young nation, formed since the last Night of Blight. Formerly a part of Wet Plains, it also produces rice and jute as major export crops, and also collects heavy duties for trade along the Western Elf Road river. The nation is run by a large, hierarchical priesthood of the Temple of One God, led by the High Priest of One, who is believed to be in direct contact with the One God. The priesthood makes all decisions and performs all functions normally associated with civil authority, such as legislature, law enforcement, and judiciary. The Temple of One God teaches that the ten-thousand gods are mere reflections of the One God, created so that people could more easily grasp the concept of godhood and relate to the One God in a simpler, if less accurate way. Worship of the One God is highly regulated, with specified times of worship announced from local temples. The people of the Theocracy, while by no means dour, do tend to be rather enthusiastic about their religion and actively try to convert those who enter their lands. Those who do not worship the One God directly may still worship in temples to the One God, but must pay a small fee. The single most serious crime within the Theocracy is apostasy – the penalty for abandoning worship of the One God is death, as is the penalty for any who successfully convince someone to abandon the worship of the One God. There is, however, no penalty for attempting to convince someone to worship the One God, nor is there any penalty (aside from a small fee) for worshiping other gods unless one has previously converted to worship of the One God. One – the only real city within the Theocracy, One is the location of the Great Temple of One, where the High Priest of One and much of the government live. It is also a thriving river port, with barges from up and down the river putting in here to sell, trade, or pay tolls to continue their journey. Prior to the most recent Night of Blight, One was known as River City, and some people still refer to it as such. The land of Brave has a unique background, and a unique culture. While everyone knows of the legends of the gods and of the great heroes who have represented them throughout history, the people of Brave – from their rulers down to the lowest farmers – all believe fervently that they ARE great heroes, either serving the gods in some capacity, or having been chosen by the gods to serve at some past (or future) time. Most of Brave is jungle, and its people live primarily in small, self-sufficient communities. Primary exports of Brave are extracts from jungle plants, tea, pelts from jungle animals, some seafood, and the berries from a plant known as coffee, which is both invigorating and addictive. One of the favorite pastimes of the citizens of Brave is boasting. From farmers and ditch diggers all the way up to the First Hero, boasting is considered an art form, and one in which everyone, regardless of station, is equal. Much of this boasting is not idle. The jungles of Brave hide many dangerous monsters, and both the mountains and the sea on their borders teem with creatures left over from the last Night of Blight. Monster hunting, and monster fighting, are a way of life for everyone in the land, and everyone must be ready to fight to defend their home at a moment’s notice. City of Heroes. This is the nation’s major port, and also the seat of its government. Brave is governed by the Council of Heroes, led by the First Hero. There are no specific requirements to join the Council of Heroes, except convincing the current members of the Council that you are one. Once a member of the Council, you need only convince the other Council members that you are most suitable for the role of First Hero to be elected. If you are found to have acted in a manner inappropriate to a true hero, the Council may vote you out. Thus the composition of the council can change from month to month, or even day to day, and much time in any council session is taken up with boasting. Elves are not governed by the same arrangement as humans. Each elf is connected to a family lineage. Each family is connected to a clan. Each clan is connected to a tribe. And each tribe is overseen by elders who meet (or, in cases of those too infirm to travel, live) at the great tribal meeting hall). The Western and Eastern Elvish tribal lands are both quite similar. The first thing one notices are the odd trees, which are not broad of leaf like trees in other areas, but have leaves which are slender and pointed. The trees give off a sharp, spicy scent. Elves use these trees for many things, from brewing medicine to making clothing to manufacturing most of their tools from the wood. Elves also claim rights to use of the whole of the Elf Road River. These rights are generally recognized by Wet Plains, but not so much by the Theocracy of One God, which has led to considerable friction in the last few decades. It is not common for elves to leave their territories, but when they do, they fully expect to be given free passage along the river and can become angry, even violent, if it is not granted. Elves of the territories are strict vegetarians due to their religious beliefs. High Wooden Nest City – not really large enough to be called a city, it is the only group of permanent structures in the Eastern Elvish lands. It is here that those who are too infirm to continue their nomadic lifestyle are brought and cared for, and here that those who need fixed sites for their work, such as blacksmiths, set up their workshops. The tribal court is here, where elders meet to work out issues between tribes and clans. Traditionally this is also where canoes are built, and some clans and families will haul logs for many miles in order to have their canoes constructed here and placed at the headwaters of the East Elf Road River. It is said this city is constructed entirely in the trees, but this is not really so. There are numerous ground level, and even below-ground buildings as well. High Wooden Nest City was completely destroyed during the last Night of Blight, and many of the buildings and constructions are quite new looking. Bird Song City – broadly similar to High Wooden Nest City, save that constructions are usually large, communal buildings built partially into the ground, with wooden roofs and high, carved tree trunks listing the history of whichever family, clan, or tribe uses the building. Bird Song City is also known for the profusion of singing birds which live in the trees, perpetually filling the air with their music. Prior to the last Night of Blight, the two lands known now as the Patriarchy and the Matriarchy were a single kingdom, in the midst of civil strife. After the death of their previous king, two of the king’s heirs laid claim to the throne. The firstborn son was widely acknowledged to have the legitimate claim, but was just as widely considered to be a poor candidate for rulership. The firstborn daughter had no traditional claim on the crown, but was widely considered to be a much better choice. And so a civil war broke out, dwarf against dwarf, as the two candidates vied for the throne. The Night of Blight put an end to that. Beset by hordes of monsters, the dwarves had to set aside their differences and fight for their lives. In the aftermath, everyone was too busy rebuilding for a generation to continue the war. For now, the two realms exist in uneasy coexistence that could break out into conflict at any time. The primary exports of the Dwarven lands are gems, minerals, and worked metal items of superiour craftsmanship. The Onyx Palace – traditional seat of the Dwarven government and capitol of the Patriarchy, the Onyx Palace is a series of caverns and chambers carved into the side of a mountain over many generations of dwarf. Hundreds of years have passed since the city met the needs of its dwarven inhabitants for space and facilities, but work continues because of a prophesy that one day all of the surface world will fall during a Night of Blight, and only the Onyx Palace will remain to safeguard the refugees of all races. The Rose Caverns – traditionally, the Rose Caverns have been not so much a city as a tourist locale – a series of caverns with walls of glowing rose quartz. It was chosen as the capitol of the Matriarchy out of necessity at the time, and has remained the capitol since. By the standards of most capitol cities it seems under-developed and maintains something of a frontier feel, though efforts are ongoing to make it more civilized. This in turn has led to some cries of outrage from the locals, who dislike the idea of the natural caverns being destroyed. Poetland – the rolling hills and quiet valleys of Poetland are where most halflings live. Unlike the other races, the halflings have no real cities or large government structure. Instead, they live in independent towns and villages, each ruled over and run pretty much as the inhabitants choose. Poetland gets its name from the halfling fascination with word games and verbal art forms. Impromptu poetry contests are common entertainment at get-togethers, and puns and other wordplay are considered a high art form. To the North, beyond the great glaciers, there is said to be a high plateau which is the original home of the halflings. It is said that here halflings still live as nomadic herders, riding their tiny ponies and protecting herds of huge yaks. It is also said that Roof-of-the-World, the tallest mountain (featured in many stories of the gods) is here. To the West lies Holy River Nation, said to be a vast kingdom which encompasses the Holy River, from which all the gods came. Long ago Holy River Nation controlled all of Wet Plains and the surrounding territory, but has not done so for over a thousand years now. After the last night of blight, contact was lost with Holy River Nation, but recently some traders have returned from a perilous trip through the mountains, and report that they have learned the location of a trading fortress. To the south, across dangerous seas, is said to lie the Island of Beautiful. Tales make it out to be an idyllic place, populated by kindly beings (the exact sort of being varies according to who is telling tales of the island). Because the oceans are very dangerous – particularly so since the last Night of Blight – there is nothing reliable known about the island or its inhabitants. To the east, there are vast tracts of monster-infested mountains and jungle. It is said that there is a vast and ancient empire of dragons far away to the east, but this is entirely legend. This weekend Sophie and I attended Good Omens Con – a small, free, one-day event over in Oakland at Endgame. There were, I think, six tables full of gamers for two sessions – one morning, and one afternoon. Canned food was collected for the Alameda Food Bank, which I thought was fantastic, and there was pre-registration online for events, which I also thought was fantastic – and something that even minicons can benefit greatly from. Endgame is a very nice place to have a minicon, as it has a bunch of tables upstairs. It also has oodles of terrain and terrain tables and a painting area and some very nice models on display and … games. The bathrooms are clean (well, at least the Men’s Room, and I didn’t hear any complaints about the Women’s Room so I assume it’s the same), the store itself is well-lit and spacious (as opposed to dank and creepy – older gamers, you know what I am talking about) and has a wide selection of games, including a “pre-played games” section. All in all I rate it an EXTREMELY dangerous place to go if you have excess money. Be warned! Endgame is now my official FLGS. Now, on to the important parts – the games! I played in one and ran one. TIME AND TEMP – for the morning slot I played in a game of Time and Temp. Without going into gross detail (you can check out their website) Time and Temp is a game about time travel. Everyone is an employee of a company that handles travel through time and guards the timeline against disaster and modification. Because “important people” muck up the timeline more than anonymous schmucks, the agency hires only temp workers to handle its field work. Players write up a Curriculum Vitae for their characters – three previous jobs, with two skills per job. The whole process takes about as long as it takes you to come up with a character concept, plus a few minutes of scribbling. Here’s my character, Zlato. Skill resolution is based on rolling one or more dice. The size of the die is based on a negotiation between the player and the GM regarding a) how impressive the result will be (are you trying, for example, to hear about local gossip or teach someone to invent chocolate chip cookies before they were historically invented), and b) how much effort it takes (is it something that can be accomplished in a few minutes, or will it take hours, days, or even weeks). Based on the outcome of the negotiation, you will be rolling anywhere between a d4 and a d 12. Skills bump the die size up by one, and you can use up to two of them on a single roll. before rolling, you decide how much risk you want to take – the more risk you take, the more dice you roll. You can choose to risk incident (you succeed, but something complicates the situation), failure (you don’t succeed) or – after a certain point in the game – paradox (you succeed, but the timeline starts becoming unstable). The real heart of Time and Temp is the Matrix. Every time you roll in Time and Temp, the number you roll goes on a matrix, creating a sort of Sudoku-like effect. When you get a certain order of numbers (for example, nine unique numbers in 3×3 square) there are temporal effects – for example the party might get a chip that allows for interesting temporal effects such as rerolls. In addition, there is the anachronometer. Every time you roll a specific number, it gets checked off on the anachronometer. The more often a specific number is rolled, the more check marks it gets. So, for example, if you roll a “2”, you check off a box on the “2” section of the anachronometer. The first couple of boxes have no effect, but after that every time you roll that number, it begins to build up paradox. The more paradox builds up, the more unstable the timeline becomes. Too much paradox and the timeline breaks and… “nothing ever was”. Game over, man. A big reason that you want to roll larger dice is for the more variable numbers – too many d4s and you generate paradox way too early. Our game had a total of 23 die rolls over the course of four hours (though I admit, about halfway through the game we all got the idea that we wanted to push the game system to see what it could do, so we wanted to roll plenty of dice). At the end of the game, because of some unusual die rolls, we were dangling at 4 paradox when the final die roll came up – five paradox would be the end of everything! It made for a nice, suspenseful climax. We also got to use three chips that we had saved up for the climax to generate a very cool temporal effect – three additional “copies” of each character from different periods of the timeline showed up to help us out! It made for a very surreal and “timey wimey” ending. I enjoyed Time and Temp and recommend it for a nice, simple time travel system. The flavor text of the game can be easily adapted to any setting (“Primeval” comes to mind) and the system gives you a nice, suspenseful feel for potential unexpected effects of mucking about in the past – for example the single event that had the greatest effect on the paradox level of the game was my character rolling some drunks for pocket change. So that was my morning game. In the afternoon I gave my “Fiasco 40K” playest a test. Let me just say first of all that I had GREAT players for Fiasco 40k. One player had NEVER HEARD of Warhammer 40K previously, but was seriously awesome anyway. A second player had only read some of the novels (for which, depending on the novels, he had my sympathy, and a third player was a 40K Imperial Guard player from way back (and of course there was Big Boss Sophie – WAAAAAAAAGH!). Still, everyone knew Fiasco, so things turned out superbly. Because I was concerned about the player who knew nothing about 40K needing some help, I decided that I would not take a player position and would instead facilitate. Well, it turned out that I didn’t need to do that because everyone was great – but I had a wonderful time anyway. Without going into a blow-by-blow retelling of the game (maybe Sophie will do that on her website – if so I’ll link it here) the game started out with all the characters cut off from their Inquisitor in Gunmetal City. We had a spy who was manipulating a reformed human bomb who was under the command of a Commissar who hated and was hated by a Guardsman who had been rescued by the Spy. Much of the game centered around a lock of hair that both the Commissar and the Guardsman claimed as a trophy, and which may or may not have been partially Genestealer. The spy, meanwhile, was trying to get dirt on the Guardsman (and, well, everyone else). Cultists, Genestealers, the Ruinous Powers all made guest appearances, and the game ended up with a full-blown Tyranid invasion of Gunmetal City! In the aftermath the Guardsman became little more than a husk wandering the underhive muttering “its my lock of hair”. The former human bomb was sucked into a Tyranid hive ship and slowly dissolved. The Commissar accidentally shot her Inquisitor and was demoted to do nothing but lead units of Penal Legion troops and human bombs on unimportant missions, and the spy was torn limb from limb by a lictor, but survived and got cybernetic implants – then was promoted to Inquisitor! At the end of the game I got a lot of good feedback from the players on the playset, centering around how to make it more accessible to people who don’t know about the 40k universe, and then we all sat around for an hour just shooting the breeze and talking about gaming. It was a great afternoon and I really hope to see some of those players again at FATECon or BigBadCon in the near future. All in all, I must say that it was a very, very successful day! Many thanks to the players in both the games I participated in, who made my day so much fun, to Sophie for running Time and Temp, to the convention organizers, and to the staff of Endgame! I am going to be running “Fiasco” at the upcoming Good Omens Con and for the occasion I decided to finally bite the bullet and write up my own playset, based on the game “Dark Heresy” set in the Warhammer 40K universe. Here’s the draft. Pulpit Games based on the DARK HERESY roleplaying game and the Warhammer 40k universe published by Games Workshop. we’d like to help. Write us at info@bullypulpitgames.com. It seemed like another routine mission in the service of the Holy Inquisition – travel to Gunmetal City on the planet Scintilla, track down some chaos cultists, and eliminate them. The sort of job you have done countless times. But this time something went very wrong. The information you were given was bad, the cultists were tipped off, and now you can’t get in touch with your Inquisitor. For just this moment, you are out from under the vigilance of your master and the Holy Inquisition. It’s time to prove that you have real leadership ability by completing the mission… or to settle old scores. 2. The enemies of the Emperor! 4. to the Webway, where your Eldar masters await. 6. A vast cavern, filled with mine tailings and industrial cast-offs. 6. A small, furry, disconcertingly friendly alien pet. 2. A huge, ancient, spikey sword with indecipherable writing, an unsettling sheathe, and a taste for blood. 6. An unidentified artifact – it might be powerful, it might do nothing. To tell your Inquisitor about the heresy of the other acolytes. The locations in this playset are specific to Gunmetal City, one of the locales in the published material for Dark Heresy. Facilitators or players can substitute their own locales to set the scenario on any of a variety of worlds. Last night while I was falling asleep I thought about my post regarding the Unsung, and realized that the original post, to which it referred, had been on Facebook, not on this website. 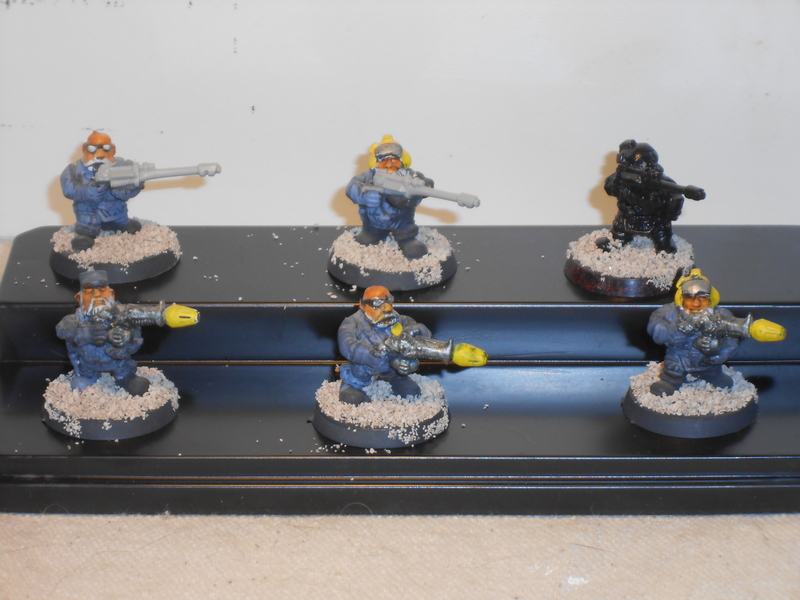 So, here’s the bit on my Imperial Guard unit – the Unsung. I have always loved the Guard, to way back in the old Rogue Trader days. The idea of a mass of guys who weren’t superhuman like Space Marines having to go up against crazy alien stuff like Eldar and Orks and Chaos, generally armed with substandard (in game terms) lasguns, a few heavy weapons, and morale that was low enough that failing morale checks was actually possible, intrigued me. When GW revamped the Guard and turned it into a tank army with a few guys who might occasionally get out of their APC to shoot something, I was very disappointed. I didn’t want a mechanized Guard army – I wanted a big mass of guys on foot, with maybe a vehicle or two for support. I also very much loved the abhumans. I had a whole bunch of Beastmen that I had painted up for my old Guard unit. These had disappeared, along with Squats, Medics, Jetbikes, Thudd Guns, Rapiers, Tarantulas, Commissar Cadet Squads, Robots, and Roughriders with lasguns. I missed them. So when I decided to put together a Guard unit again, just to have something to paint, I decided I wanted to add in as many elements as possible. The unit was for friendly gaming only (I don’t do tourneys because while the vast majority of people are nice, there is inevitably the one who thinks that taunting and trash talking for the entire game gives some sort of “psychological edge”, and I don’t really feel like having my convention experience marred by murder charges) so I figured I could proxy models as I liked, so long as I was clear with my opponent about what they were. Thus – the Unsung were born. 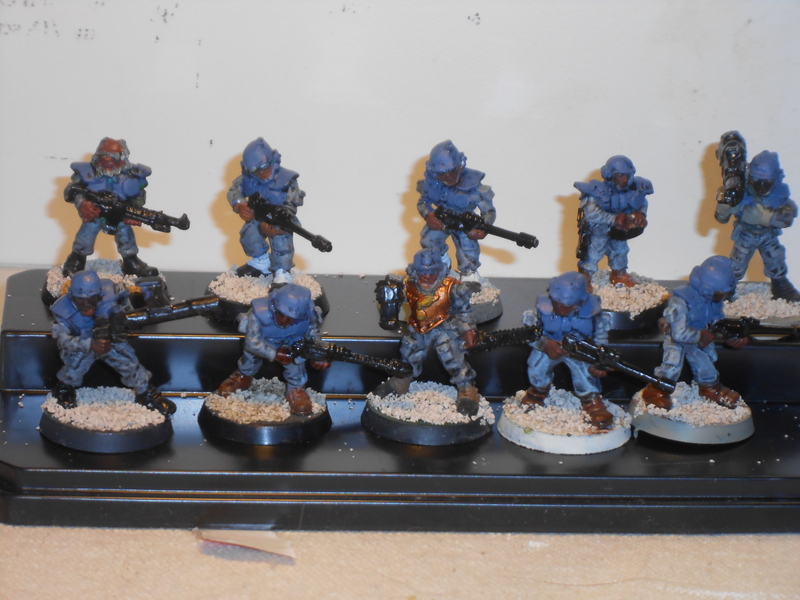 The Unsung started out as an Imperial Guard Abhuman company. They happened to be doing a tour in the Squat worlds when the Tyranids showed up*. The unit got busted up, managed to reform with a bunch of other rag-end refugees, and would have been obliterated along with everyone else had they not been snagged by a mysterious Rogue Trader vessel. Now they have been claimed as part of the Rogue Trader’s entourage and essentially do what the Rogue Trader tells them to do (I have a figure in mind for the Rogue Trader if I can ever figure out how to include it). They travel from world to world, obviously looking for something, but are pretty much kept in the dark about their shadowy master’s true goals. Because of the nature of what they do, who they do it for, and where they do it, they have adopted the name “The Unsung” They wear no unit badges, bear no unit designations, carry no flags. They all know that they will die alone – probably outside the light of the Emperor’s grace. I want the unit to have a very mixed look, and to use a lot of the old GW models. Tactical squads will generally be human, heavy- and special weapons squads will be squats. I’ll eventually fill in the abhuman contingent with ratlings and ogryn, and I have what I think will be an absolutely awesome mixed bag of old GW models to use as a conscript unit. I have plans for a Stormtrooper unit made up of Commissar Cadets, a Veteran unit made up of Beastmen (led by an Imperial Priest modeled from a Warhammer flagellent! ), and a few other odds and ends as well. For now, at the 1,000 point mark, the unit doesn’t have quite the feel that I hope it will have as it gets bigger (the conscript squad will certainly change that, and it should be coming at the 1,500 point level), but I think it is coming out well. *The somewhat tongue-in-cheek GW explanation for why Squats don’t show up anymore is that the Tyranids came along and ate them all. I discovered soon after my last post about the Unsung that several of the models that I was planning on using for various units are still in Seattle. So I needed to do a little bit of rethinking and redesigning the basic 1,000 point army to go with the minis I had. Since I had to substitute, I needed to go back to some earlier stages for some of the models, and do stuff like flock the bases, and in a few cases even base coat. But at least now I have all the models I want to use ready, so that I can catch up with base coating the stuff that I had to substitute, and then get back to line painting the whole army. Here’s the command squad. 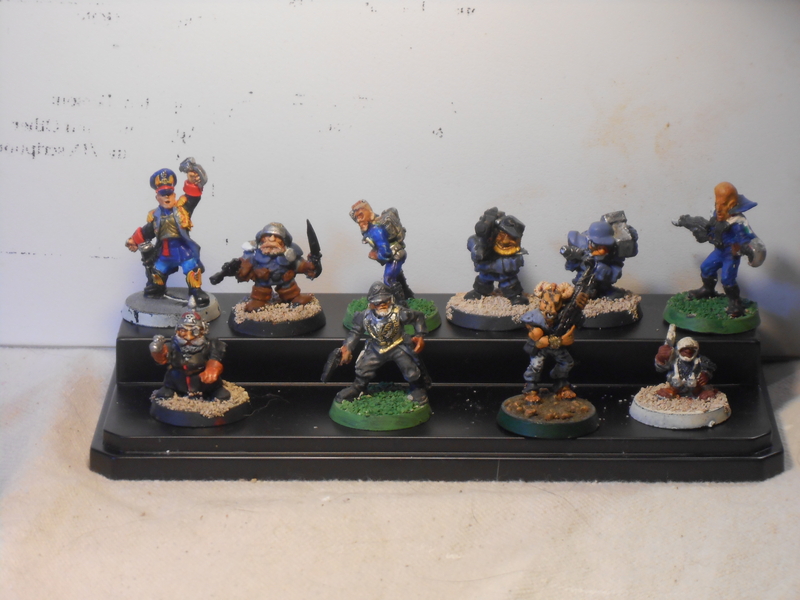 Left to right, top to bottom they are – Master of the Fleet, Medic (Squat), radio operator, lascannon team (squats), astropath, Master of ordinance (Squat), company commander, bodyguards (one Beastman, one Ratling). I wanted the Company Command squad to have an ecclectic feel, reflecting what I hope will be the eclectic feel of the army as a whole. I do have an Astropath figure up in Seattle that I like better than the one here, which I will eventually switch out. This is the Platoon Command Squad. It has a couple of squats operating one of my favorite old 40K weapons, the Mole Mortar. Note also the medic (upper left, and the commissar (lower right). Typical infantry squad. 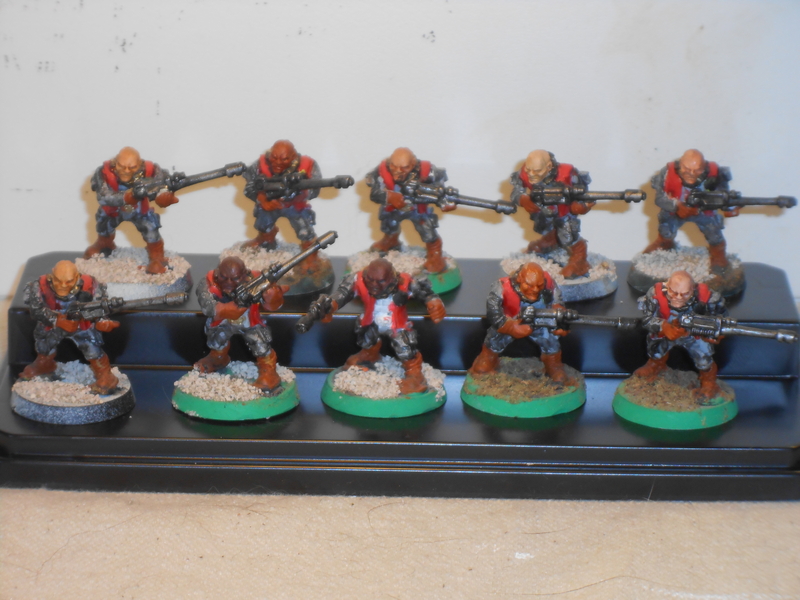 I have five of these – two with heavy bolter teams, two with autocannon teams, and one with a lascannon. They all have grenade launchers as well, and the sergeant has a bolt pistol. 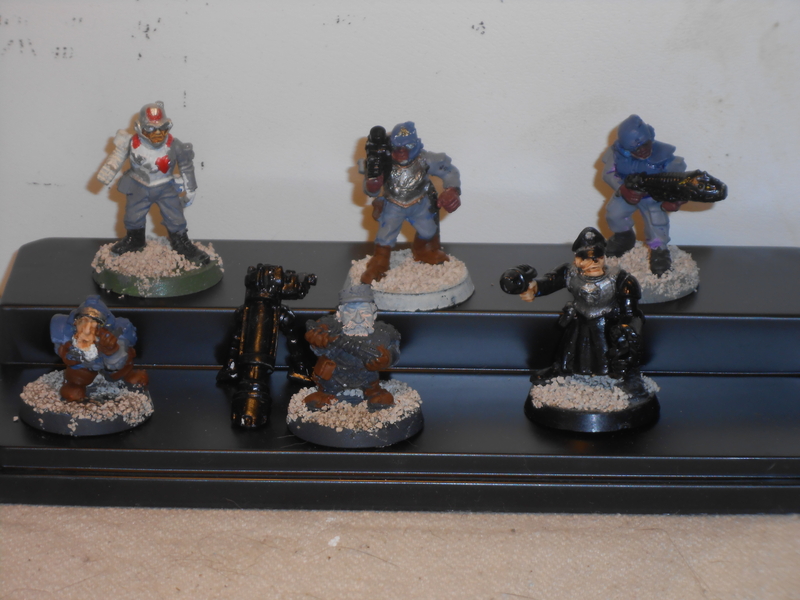 I tried to include one old Imperial Guard model in a non-standard pose in each squad. In this case, it’s the figure upper left. For this army, I want humans to make up the tactical squads, and squats to make up the Heavy Weapons and Special Weapons squads. These fellows are carrying old style Eldar melta guns. I figure I will need them for anti-vehicle work, given the low number of lascannon I have at this point. I got these on eBay a long time ago. These poor bastards are the main maneuver element of my army at 1,000 points! I am required to take two infantry units, and everything up to this point only counted as 1! I was going to use a Veteran or Stormtrooper squad, but those have models up in Washington right now. Hopefully I can get them back by the time I get to the 2,000 point mark. 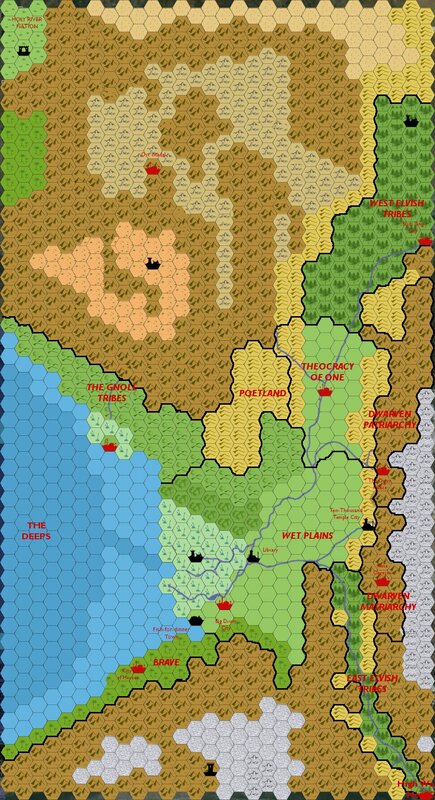 Here is a hex map of the land of Wet Plains that I have been making because a) I felt like doing a hex map and b) I felt like doing a slight hack of Dungeon World. Not all the labels are in place yet. 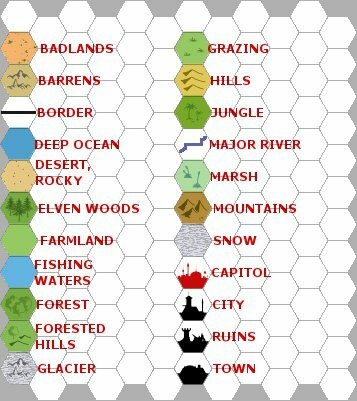 – each hex is about 1 day’s walking distance through the terrain shown. – the map is very loosely based on the area around Bangladesh. More stuff upcoming unless I lose interest.